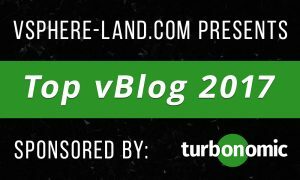 Top vBlog 2017 update » Welcome to vSphere-land! So the voting closed about 2 weeks ago and we had over 1,600 people vote this year. Afterwards I had to export all the survey data to Excel and apply the weights to all the votes to get a total point score for each blog. The way that works is a #1 vote is worth 12 points, #2 vote is worth 11 points and so on down to a #12 vote is worth 1 point. In the past I’ve had to manually count the number of #1, #2, #3, etc. votes for each blog but starting last year I was able to automate it in Excel so it’s much simpler and accurate. This year there are two additional point modifiers that are applied to each blog that factor into the total point score. These were added in an attempt to make this less about the popular vote and reflect the work the bloggers put into maintaining their blog. The first is the number of posts that a blog had in the year, I applied 2 points for each post up to a maximum of 400 points, so the more active a blogger is they are rewarded for it and will be ranked higher. For any site that was a pure blog aggregator with automated content they were scored at the minimum 10 posts. The second score modifier is based on how well a site is constructed and how well the end user experience is. Any blog that was bloated and inefficient is scored lower than blogs that are optimized and fast. The measurement for this that I used was Google Pagespeed which analyzes a website and scores it with a percent with 100% being best. I ran every blog through Pagespeed and the resulting percent is used as a score modifier. Every blog started with 200 possible points available which was reduced by the resulting Google Pagespeed percent. So if your blog scored a 70% it would have a 140 point modifier applied to you your total point score. I’ve spent hours and hours in Excel getting all these modifiers in, thanks to Andreas’s blog post counts it helped me immensely not have to count blog posts for each blog but there were still a few dozen that I had to go count. 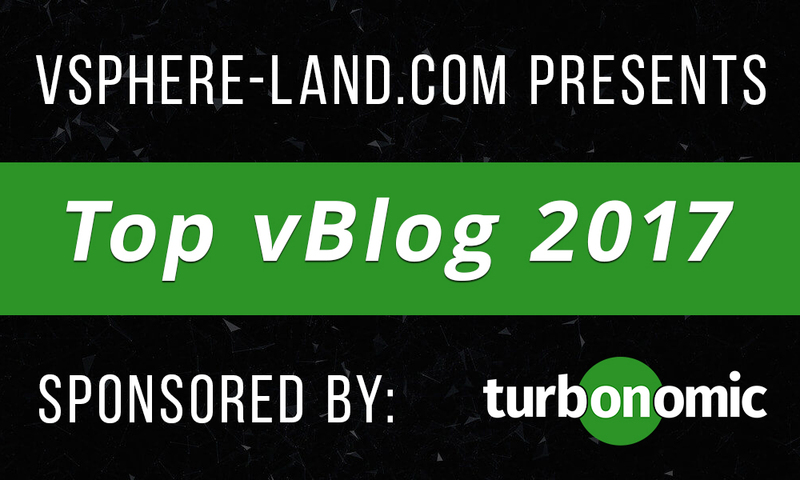 So all the scoring is now complete and we’ll be announcing the results via a live Top vBlog Results Show hosted by Turbonomic with myself, Eric Wright and John Troyer. We’ll be using a standard webinar platform this time around as Google Hangouts was rather limited and a pain to use. Also this year instead of doing commemorative coins we’re giving nice 1.5″ lapel pins to the Top 50 bloggers. They will be different medals just like the coins were for Top 10/25/50 and because there are no die costs we can have them made Top 10, Top 25 and Top 50 instead of all of them saying Top 50. The pins will be done before VMworld US and you can pick them up there, if you are not attending we can mail them to you. So stay tuned for the details, the webinar will be held the first week of August.